As authors and introverts, we might not want to step up to a mic and read from our work but we know we need to master the skills of book marketing. Who wants to be that author who wrecks their book launch because they didn't know how to use a mic, the one who says, "Hello," hears their voice echoing from every where and spends the rest of their stage time acting as if the mic is holding a knife on them? Here it is, the evil device. It doesn't look menacing in this context, right? This is the business end. Do not be afraid of this, it won't bite. After verifying that there is no short, and getting the mic stand to the correct position, touch your lips to the grill of the mic. Now back off no more than two inches. The whole point of the mic is to pick up what you say, in order to do that you must be close to its surface. I suggest before you actually speak to the group, you test the mic, verifing that the level is correct and that you get used to hearing your voice 'booming' in the space. I can't tell you how many times all of the proceeding steps were taken, the author steps up to the mic and says "hello," hears their voice echoing from every where and spends the rest of their time on stage acting as if the mic is holding a knife on them. It is also good form to ask the assembled group if everyone can hear you. If not, move your mouth closer to the mic, if that doesn't help, speak louder into the mic. I guarantee that if you speak loudly into a mic everyone in the room and possibly across the street will be able to hear you. HINT: as you relax during your reading it will be natural for you to move away from the mic, to stop this from happening, keep your lips on the grill the entire time you are using it. 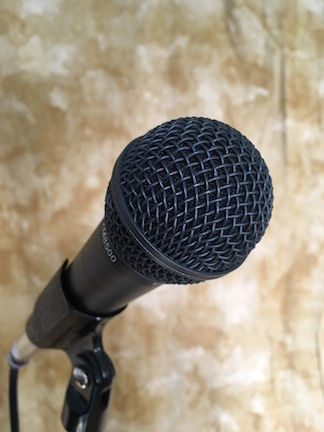 Using a moist towelet on the mic grill before you start, and when you finished, will keep down the gross factor. One thing you should always do, check the mic to make sure its not going to shock you. ALWAYS check with the back of your hand, keeping your head/face out of the way. If there is a short, you NEVER want to grab a mic or stand with your open palm. The short will contract your muscles and put a death grip on the mic. Even if someone else has set everything up before you check the mic! With modern Public Address (PA) systems you don't run into this as much. Better safe than sorry. This is a mic stand. 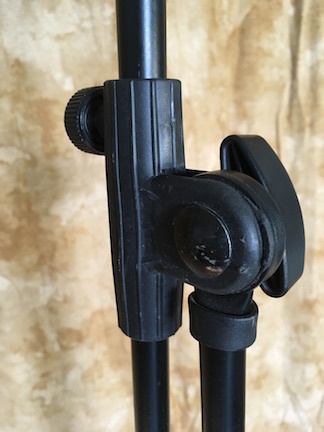 Actually it is a boom mic stand, but you will find some of the same parts on both stands. These are the parts of a mic stand. 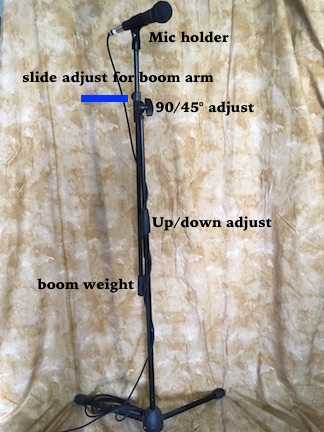 With a boom mic stand, you will need to adjust the length of the boom arm. With any mic stand you will need to adjust the height. All adjustment knobs to loosen turn counter clockwise (Left to loosen), clockwise to tighten (right to tight). Please, Please, Please, do not move any parts of the mic stand without loosening the adjusters first. 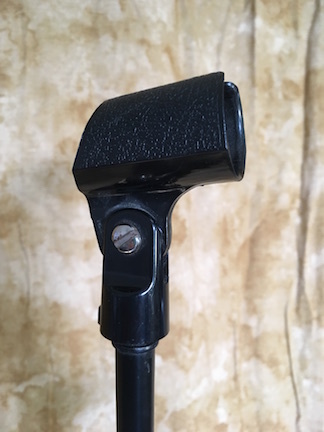 You'll be stripping the effectiveness of the adjusters, eventually the mic stand will not be able to stand up on its own. These are the control knobs, for the boom stand. The 'wing' knob allows the boom arm to rotate. The 'thumb' screw on the back side allows the arm to slide, to make it longer or shorter. This is called the mic holder. It screws on to the mic stand, always a good idea to check and make sure its screwed on tight. To adjust it to your mouth, simply rotate it up or down. Mic in the mic holder. 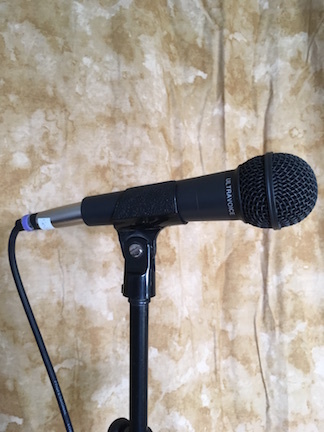 The mic stand will be correctly setup when the center of the mic is in a dirct line with your mouth, as you stand comfortably. 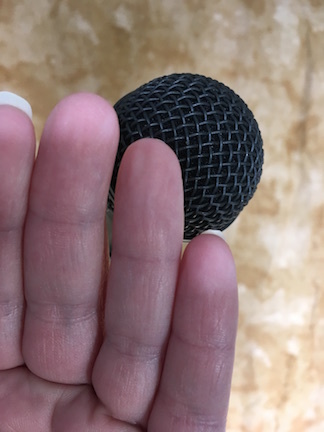 Verify that as you hold or look down at whatever it is you'll be reading that the mic is in the correct position. 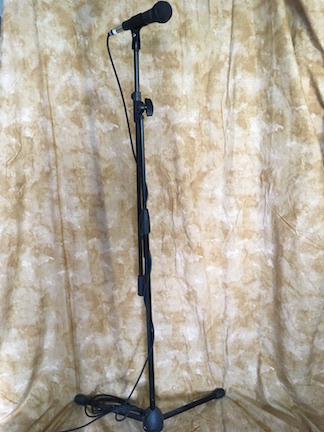 Hint: a boom mic stand will make it easier to position if you are standing at a podium. 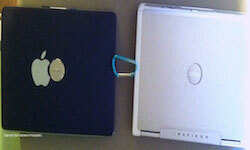 Another tip, as you adjust the height don't pinch the cord. If it is strained that is a trip hazard. The mic stand must fit you, if there isn't enough cord, move the stand away from the front of the stage. At least several days before you face your public, decide what you will be reading. PRINT IT OUT, use a large font, easily seen from a distance. Spend some time reading the piece out loud. 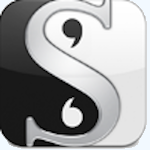 Figure out where you want to pause, raise or lower your voice for emphasis, marking it on your copy. 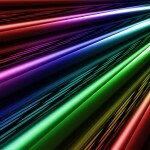 Verify you are within the allouted time. Record yourself, are you speaking clearly, at a pace that is easy to listen to? Practice makes perfect. So there you have the basics of operating the microphone. I hope this has helped quell any anxiety you might have had so that you are on stage with confidence letting your writing, not your lack of familiarity with the technology, be what the audience remembers.